Starting with an introduction to SAP ABAP, this course is reputed for educating candidates about ABAP programming techniques and other minor details of its dictionary. In most cases, the fees for this SAP module ranges from INR 6000/- for a 5 days course to INR 35,000/- for 15 days. Introduction to ABAP Programming: an overview, mastering of tools and building application programs. ABAP Dictionary: For an in depth knowledge of terms in the ABAP dictionary. ABAP Web Dynpro: Detailed development of application programs and designs. ABAP work bench: Gives a fair idea about the creation of dialogs and use of work bench tools. A certified SAP ABAP fresher can enter this field as a consultant. Once he/ she has skillfully handled a couple a projects, the next job profile could be that of an ABAP programmer or a SAP ABAP consultant. After having gained certification in the SAP ABAP workbench, an ABAP developer may aspire for the position of a qualified SAP ABAP design developer. With an increase in the number of projects that have been implemented in a successful manner, ABAP professionals get rewarded with higher salaries that range from 6K to 100K (the figures being dependent on their experience levels and overall skills). Over the years, there has been a sharp rise in the demand for ABAP developers and consultants; all across India and outside its borders too. This has made ABAP a much sought after module in the world of SAP. Best suited for SAP ABAP developers, IT professionals and project team leaders, the course related to Introduction to ABAP programming is as essential as the specialized ABAP Dictionary course recommended for dictionary administrators and project leaders. A great course for those aspiring to gain a flourishing Career in the field of SAP and freshers alike, the SAP ABAP programming course requires rigorous training for best results. A University degree, preferably in the field of computer science. Prior experience in object oriented programming languages. Good logical reasoning and basic communication skills. 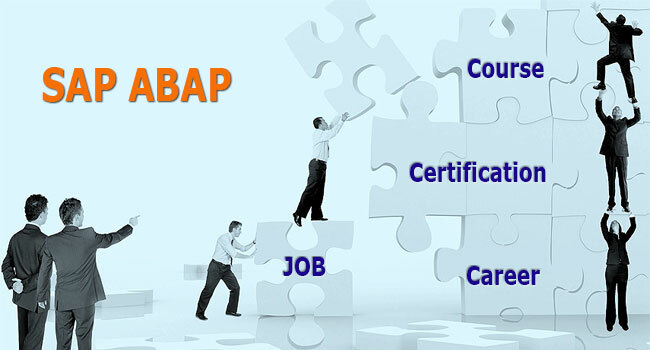 Certified ABAP consultants are familiar with the basic concepts, architecture and important tools of the SAP Net Weaver Application Server ABAP and has in-depth knowledge about the ABAP development environment. They are fully equipped to create smart business applications, explore ABAP Objects and use the features of Web Dynpro for ABAP—which is SAP’s main UI technology suited for ABAP applications. With a command over ABAP objects and other aspects of its programming and developing environment, ABAP consultants are making their SAP applications more secure, scalable and robust. So, join the bandwagon and look forward to smarter salaries, a positive looking career path and more challenging projects coming your way—today!